Though my love for many forms of music runs deep I don't claim to be an expert in any particular genre. 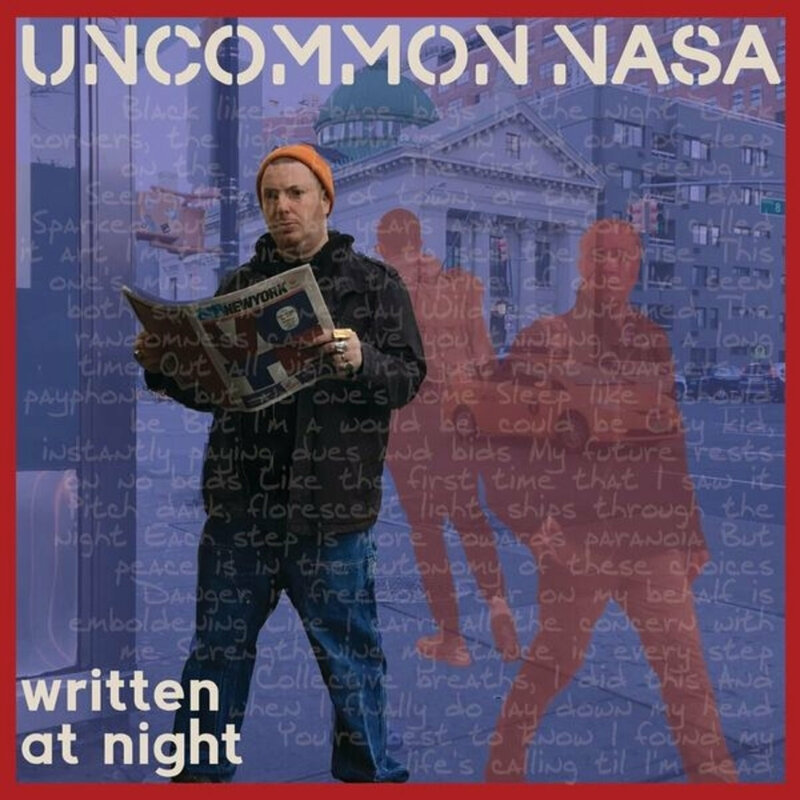 But I'm always carrying my 2¢ and have been eager to post about the forthcoming album "Written At Night" by Uncommon Nasa for some time now. Whilst it's true I've not been a listener until very recently, he's an artist that's been on my peripheral through mutual friend Lyle Horowitz. Having admitted to that it would be erroneous for me to try to appraise his work on the little of his catalogue I've managed to get through, but I still feel it's important to share details of his new release and let you decide for yourself. 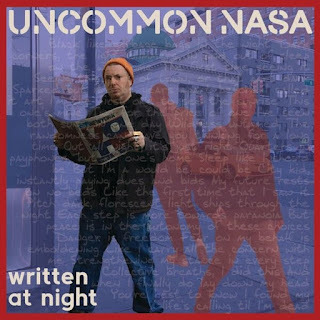 "Written At Night" is Uncommon Nasa's fourth studio work and first that is fully produced by himself. It features collaborations with Open Mike Eagle, Guilty Simpson, Oh No, Quelle Chris, billy woods, Mike Ladd and many more. This album is a one time only combination of uniquely talented people working together to create high quality songs around a central theme, produced and concepted by Uncommon Nasa." There are those that say rap music died when the Bad Boy era came into force. Though far too general of a statement for my liking, there is a certain element of truth to the notion. I think it's true in regards to what's being presented to us through both conventional and mainstream sources and in part due to our unwillingness to make the effort to look for ourselves. For me, I do this through social media and by going to shows as much as possible. I honestly think we've been blessed with some outstanding albums over the past couple of years particularly from underground artists and groups. But this recognition comes by way of being an existing fan or knowing where to look (and equally where to avoid looking.). When we listen to "Written At Night" we might just realise that maybe we've been looking not only in the wrong places, but maybe even during the wrong times. Nasa looks and sounds every bit the archetypal New York rapper. I hope he doesn't take offence to this, this blog isn't HipHopDX and my readers may require something descriptively familiar to them. Indicative of his credentials his story telling ability ranks right up the with the best from the East Coast. I won't attempt to make comparisons, but will say he puts many high profile rappers to shame with his delivery and content. The interaction I've had with Nasa has been mixed, with Twitter not being exactly the best place for coherent dialogue. However I garnered enough for my perception to be that Nasa is doing exactly what he's on this Earth to do, and that is not to be taken lightly. The title track has a video accompanying it and for me sets out the story of the album in pretty fine detail. The feeling of the track is one of achievement despite the sombre tone, with guests billy woods and Quelle Chris providing the perfect lyrical suffusion. I had asked Nasa if I could put some questions to him in the run up to his album release but my head has just not in the right place to do anything that would do either of us any justice, fortunately Dylan Green does a great job of it HERE. The album is due for release this Friday 4th August, which leaves you just about enough time to pre-order the vinyl and get a free instrumental cassette and signed letter. I was gutted to find out that Nasa had toured the UK as recently as February this year, but hope he'll return soon giving me a chance to experience his talent live and direct.